David as the anointed leader. The person God calls to lead may not be the person we would expect. TiS 681 Lord let me see see more and more (Langmead) An excellent song - kind of long with 5 verses, but very simple lyrics on some quite tricky themes. Try to use different instrumentation for each verse to keep it from being "ploddy". The tune is very natural to sing as well. Lyrics. AoV1-021 / ATOK 402 / StS114 / G(II)488 / GC682 / GC(II)669 / G(3)761 / Lau858 / MP830 God Has Chosen Me (Farrell) Energetic, and great words of justice. We used to sing this a lot, but not so much lately. Can be rocky or smooth, however you like it. Good for kids. Sound sample and lyrics. NCH355 / UMH648 / VU514 / GtG303 / PH523 / W&R149 / Cha450 God the Spirit guide and guardian (Daw) Excellent, inclusive Trinitarian lyrics of God's guidance and blessing on leaders in the church community. Set to a variety of well known hymn tunes including HYFRYDOL (my favourite! ), JEFFERSON, BLAENWERN and BETHANY. Lyrics. New words to old tunes. TiS 10 / AHB 16 / AoV1-144 / NCH479 / Iona (Common Ground) / CH14/16 / UMH136 / VU747/8 / StS099 / LBW451 / ELW778 / GA473 / HPP55 / GtG801 / PH170 / CP519 / CP(E) 594 / W&R86 / Cha0789 / Srce662 / Lau806 / StF480 / MP660 The Lord's my Shepherd I'll not want / God is my shepherd It's not inclusive, but I think it's more than a sentimental favourite. NCH, VU and Chalice all have an inclusive language version. Traditional lyrics and sound sample. *MV126 Are you a shepherd? (Duck) Good and joyous. Lots of images of God: shepherd, teacher, mother, father. We sung this once last year, and it would be good to do it again. A catchy chorus. Good for kids. 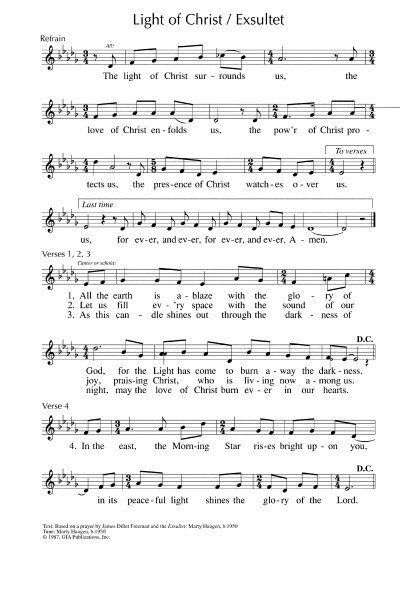 ELW438 / HPP52 / GtG803 / PH172 / Cha080 / PfAS023A / 82Hml-664 My Shepherd Will Supply My Need / My Shepherd You Supply My Need (Watts) I quite like this version of the 23rd Psalm, although hymnals vary widely in how inclusive their lyrics are; I prefer the Chalice version. The tune (RESIGNATION) is from Southern Harmony. Chalice also has a nice responsive reading (Cha081) that fits with this version. *Cha734 (I) / URW244 My shepherd you supply my need and holy is your name Responsive psalm with sung refrain to the tune of the first line of Brother James' Air. Tune In Like the sun upon my skin / God’s Mercy A beautiful ballad about identifying God's mercy in the beauty of creation. Lyrics, sound sample and songbook. Tune In / ATAR596 He comes with his arms open wide / The God that I know (Anderson) A ballad drawing on God’s strength and comfort; not easy if unfamiliar. Lyrics and sample and songbook here. NCYC'07 Lead me on (Gioia) A pretty cool gospel rock song. We used to sing this a lot, but not so much lately. Maybe worth reviving? PfAS023I My shepherd is the Lord (Villarreal) I quite like this tune, and the paraphrase is good. It's particularly good for Spanish-speaking (or bilingual) congregations; it's fine in English too. Could also use the verses with a cantor. AoV1-033 / WoV690 / ELW423 / SFFS 2058 / GtG473 / G(II)29 / GC31 / GC(II)23 / G(3)035 / PfAS023H / Lau951 Shepherd Me O God (Haugen) A nice reworking of the 23rd Psalm. The verses are a little challenging, so I would use the chant on its own: “Shepherd me O God beyond my wants, beyond my fears, from death into life”. Lyrics and a slightly odd sound sample. *Cha734(ii) / PfAS023G Shepherd Me O God (Haugen) Same as the above, but the chorus only, used as a Psalm refrain. TiS 011 / AHB 98 / UMH137 / GA025 / G(3)034 My shepherd is the Lord (Gelineau) Of the two listed here, I prefer Response 1 (Gelineau). A good alternative if you would like to use a cantored Psalm. G(II)458 / GC654 / GC(II)628 / G(3)725 With a Shepherd's Care (Chepponis) Very nice words with feminine and masculine images for God. Would be very straightforward to sing. Sound sample of a choral arrangement. FFS39 It all depends on where I'm going (Gibson) Good words of God's constant presence through all of life's travels, sung to a simple Celtic-style tune (TE HORO). Full music and lyrics here. CH716 / VU374 / FFS10 / SFFS 2128 / W&R477 / Cha575 Come and find the quiet centre (Murray) A good song for the beginning of worship. We usually sing it to BEACH SPRING (TiS 493). Sheet music & lyrics. New words to old tunes. *Online Resource Breathe in the morning air (Wiltshire) Lovely words for a soloist to sing at the start of a morning service to welcome the congregation. Sung to LOVE UNKNOWN. Free sheet music (downloads a whole book!). New words to old tunes. *Recorded Music 23rd Psalm (Bobby McFerrin) A beautiful feminine rendering of the Psalm. From the album Medicine Man. Listen to it here on Youtube. If you'd like to sing it, it's also in the Unitarian Universalist book "Singing the Journey" and "Music for Liturgy" from St. Gregory of Nyssa. 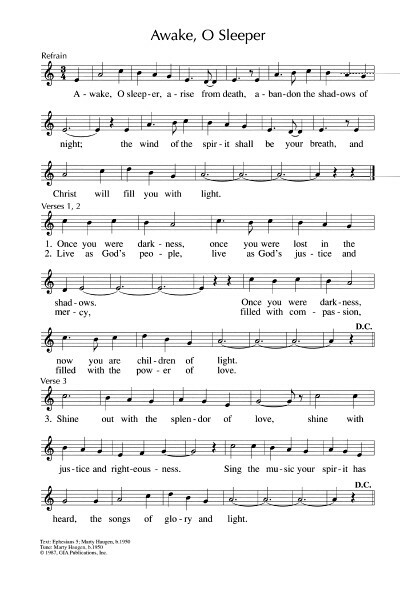 Online Resource All of my days (Bruxvoort-Colligan) A gentle song with the chorus "All of my days, God's mercy follows". Would be simple to have the congregation join in on the chorus. Breathy sound sample, lyrics; sheet music available for purchase. Online Resource Surely Goodness and Mercy (Bruxvoort-Colligan) A gentle psalm refrain with a read psalm. Breathy sound sample, lyrics; sheet music available for purchase. Tune In Light transcendent / Peace In Our Time (Brown) A groovy bossa nova song of peace and justice. A bit tricky. Lyrics. Sound sample. Songbook. *Taizé / AoV2-005 / A&M840 / GC(II)510 / SP327 / URW386 / StF360 Jesus Your Light / Jesus le Christ (Berthier) “Jesus your light is shining within us, let not my doubts and my darkness speak to me; Jesus your light is shining within us, let my heart always welcome your love”. One of the slightly more upbeat Taize chants. Sheet music, samples and translations. Good for kids. *GA173 / G(II)577 / GC803 Awake O sleeper arise from death (Haugen) Bright and joyful. Simple to sing, and brings the idea of waking up to live as God's people. Lyrics. Sound sample. W&R543 Come Build a Church (Medema) Excellent words ("Come build a church of human frailty, come build a church of flesh and blood"). Not great for congregational singing, but excellent for a choir or musicians. Lyrics. Sound sample and sheet music. MV031 Pure Love (Good) I think this song would be good for reflecting on God as the source of all love. Very simple and beautiful. Good for kids. Jesus heals the blind man on the Sabbath. Lots of stuff about blindness and seeing. VU471 / W&R692 / URW122 / StF582 Eat this bread and never hunger (Damon) Very simple tune. The first verse refers to this passage. Particularly good if you are celebrating communion this week, but will be fine if you are not. STB020 Praise Lord Jesus / Zan-mei Ye-su (Tung) A joyful song with many hallelujahs (so you may not want to sing it during Lent - this is just here in case you are looking at this passage at another time of year). It has different parts for men and women. The tune is a Taiwanese melody so will need to be taught, and would be great with simple percussion (from children?). It is quite repetitive, so would not be hard to learn. Lyrics in English and Mandarin - you will probably need a Mandarin speaker to help with the pronunciation. TiS 633 / AHB 563 Lord we are blind; the world of sight (Edge) Beautiful formal words. The tune is not immediately singable, but is very beautiful. If you have musicians who could sing this for the congregation, that would be excellent. TiS 579 / ATN 23 / GtB The blind man sat by the road and he cried / The Blind Man (Anon) "O-o-o-o-o Show me the wa-a-a-ay! Show me the wa-a-a-ay! Show me the wa-a-a-ay, the way to go home". Good for kids. 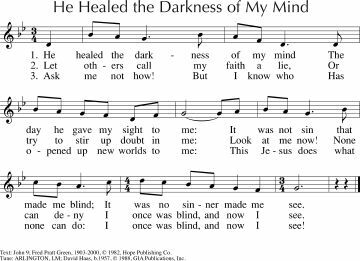 Online resource The Blind Man (Harding) An excellent, relaxed, gospel-blues rendition of this passage. Mp3 sound sample. Sheet music PDF sample and available for purchase.